It was a historic day for Dubli, in 2017, when the luxury brands page* launched in the first five countries – the US, Japan, Italy, the UAE, and Saudi Arabia and we have never looked back since. As a testament to the performance of luxury among Dubli shoppers, the page has recently been added in Germany, Switzerland, and Korea, with more countries on deck for 2019. Regardless of which market, the launch opened new doors for Dubli to partner with several exclusive brands, some truly iconic brands who are discerning about their partnerships. Residing at the top of the luxury ladder is Farfetch. Farfetch is a highly coveted site for luxury shoppers worldwide. Farfetch launched last year in the MENA region only and just last week, was added to many other global markets. Farfetch exists for the love of fashion. They believe in empowering individuality. 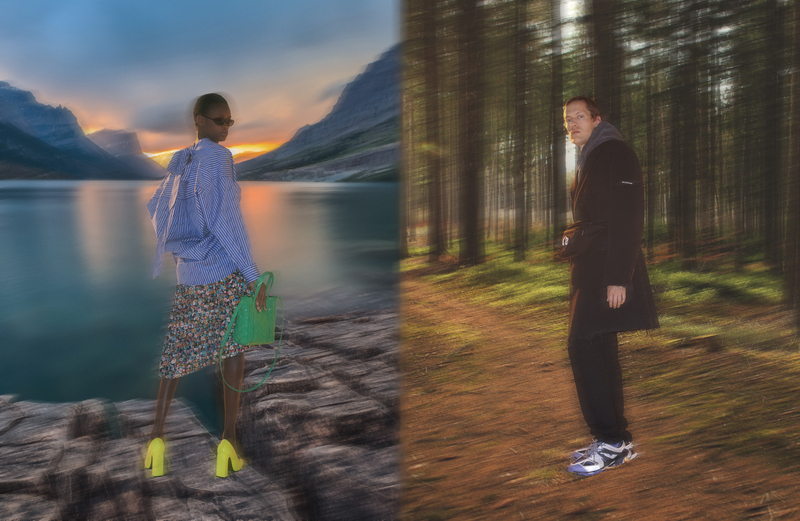 At its core, Farfetch is a global technology platform for luxury fashion, connecting creators, curators, and consumers. They offer more than 3,200 brands from their marketplace, ranging from heritage brands to emerging designers. Farfetch offers localized websites in 12 languages, multilingual customer support and great delivery options including same-day delivery in 19 major global cities and F90, their store to door option in 90 minutes. Farfetch now has more than 1000 boutique and direct brand partners. Luxury brands have always approached their websites with the deepest resolve towards brilliant design and a penchant for providing a user experience that mirrors how the brand is also perceived offline. Some design their websites in the same vein as their shoes or handbags without missing a beat. Despite the ingenious designs of many of the individual brand’s own websites, Dubli customers seem to favor sites that offer access to many luxury brands under one roof. More effective even still, is the development of sophisticated technology that provides an unparalleled user experience online, almost identical to that of the brand experience offline. Where luxury is concerned, high-end buyers expect white-glove treatment coupled with extravagant amenities. The technologies being developed today resemble the experiences customers are accustomed to from retail stores. It is not unfathomable to suggest that shoppers will be able to enjoy these same experiences online. Far and away, Farfetch is driving the technology innovation towards mirroring on and offline shopping experiences. Rarely have we seen a retailer on- or offline combine ground-breaking technology with a superior customer experience where the effect is identical regardless of channel. It’s a bold endeavor. Many have tried. Most have failed. A virtual wing and prayer up until now. Except for one. Enter Farfetch. Farfetch is redefining the future of luxury retail by reinventing the consumer experience through online and offline integrations. 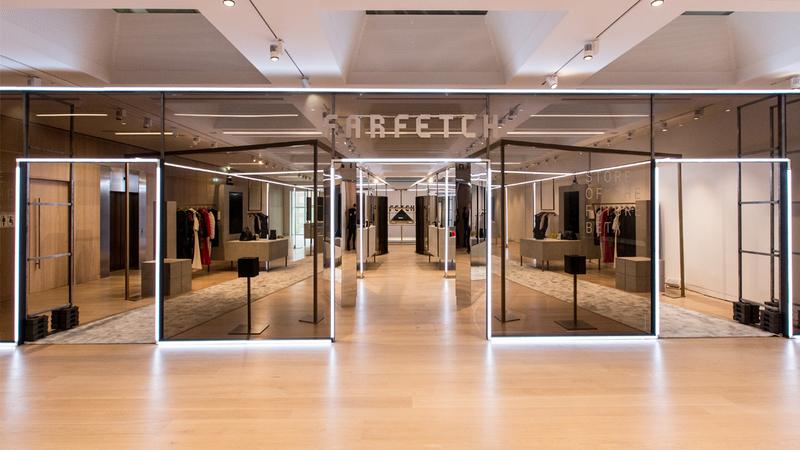 Farfetch has coined this process “Augmented Retail” which takes the magic of the physical store experience and combines it with the advantages of the online, digital experience, supported by rich data as its underpinning. Farfetch operates a modular end-to-end technology platform, with the purpose of connecting the luxury fashion ecosystem worldwide. The vision has always been to create a single operating system to address the complex demands of consumers and luxury sellers alike. Farfetch operates the ONLY truly global luxury digital marketplace at a scale where lovers of fashion anywhere in the world can shop for an unrivaled range of incredible products from the world’s best brands and boutiques. In addition to the “Augmented Retail” vision, they also launched Farfetch Store of the Future, a technology-powered retail operating system. The suite of technologies aims to improve retail productivity by capturing consumer data and enhancing interactions between consumers and sales associates, both in-store and when the consumer interacts with the retailer or brand online. To say that there is something new and different going on at Farfetch is an understatement. We have spent so much of this post focused on how impressed we are with Farfetch’s unique and innovative take on luxury, as a company, a brand, and a lifestyle but have yet to scratch the surface on the remarkable products found at Farfetch.com. While new collaborations amongst brands, celebrities and/or causes are launching what feels like every day lately, there is still little-published evidence that any create inherent value. There is one thing we can take to the bank and that is that businesses, especially publicly-traded companies that have a legal obligation to report their financial performance publicly each quarter, take a lot less risk at the expense of diminishing shareholder returns. Farfetch has a history of collaborations, just recently completing a successful “capsule”, as they call their collaborative collections of limited products, with Tommy Hilfiger. The latest capsule brings an unparalleled cache, even the greatest of luxury circles worldwide, are impressed. Say Hello to Balenciaga. Logic tells us that you don’t upgrade to the likes of a collaboration with Balenciaga if your strategy isn’t working, right? And, when two well-known purveyors of luxury goods come together to support a cause, need we say more? To expand their existing relationship, the release of the exclusive Balenciaga capsule includes limited editions in limited quantities from a variety of ready-to-wear, shoes and accessories for women, men, and kids. The collection gives Farfetch customers access to exclusive Balenciaga pieces in previously unseen colors and fabrics. The collection has been created with animal welfare in mind, without any leather, fur or down. Select ready-to-wear and handbags feature illustrations of threatened species, those symbolic of gentle strength including the Northern White Rhinoceros, the Asian Elephant, the Blue Whale, and the Giant Panda. There is so much to love in this collab that it’s hard to select only a few pieces to showcase, but we’ll give it a shot. First up, the distressed logo cardigan, knit with an all-over logo jacquard pattern, this red wool blend cardigan features a distressed ribbed hem and cuffs, a ribbed crew neck, and fabric-covered button closures along the front. Not enough to just have the cardigan? Pair with these amazing logo waistband leggings. These vibrant red (color called Lipstick) stretch fit leggings feature a contrasting logo on the black elasticated waistband, fitted legs, front zipped pockets and raised front seams. If this super cute ensemble isn’t enough, the leggings also come in fluorescent pink! There are so many fantastic pieces in this awesome shade of pink, I can hardly wait to see all the pink legs walking around. While they are calling them fluorescent, I’d like it more to a bubble gum pink. And, Shoppers, listen up! Limited edition in limited quantities is no joke, get yours before they’re gone!! I could go on forever with the spectacular line-up of products in this collection, but just one more product specimen of the fab variety to share here. While virtually everyone from Kate Spade to Prada has come with their own version of the pouch or clutch or wristlet, purse or makeup case. It matters little what it’s called as long you get your hands on it and quick. 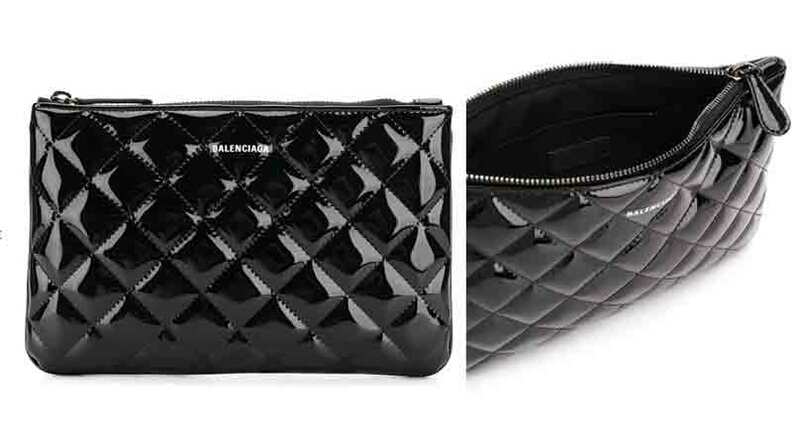 Crafted from patent non-leather, this deep black Ville M quilted pouch features a top zip fastening, a front printed logo, and an internal slip pocket, all made of synthetic substances. Quite simply, it couldn’t be cuter, in the perfect size, shape, look and feel, especially for those ladies, who don’t have a need or want to carry a full-sized handbag. This little number is as perfect for running errands as it is versatile for a dinner engagement or an evening out on the town. *At Dubli, the luxury brands page is not limited to fashion. We define luxury by price point, overall value and worth relative to the peer universe. Worth is based on intrinsic value, i.e. what will it be worth in 20 years? Simply, luxury brands at Dubli include travel and luggage to makeup and furniture, as well as electronics and even food. Don’t be surprised to find other shopping categories or verticals on the luxury brands page and for certain brands to vary by country based on the value or local worth.